Imagine the most beautiful, heart-wrenching, eloquent piece of writing you have ever read. Or the most magnificent painting or art installation you’ve seen, or maybe a cinematically grand film or moving play. Now apply that same emotional stirring you get in your gut when you feel art on that level, and apply it to this book. Yeah, it’s just that good. From the moment I began reading I was hooked. Emily Henry crafts a world so delicate and tangible that you feel as though you can visualize every detail and clearly picture yourself experiencing the story alongside the characters. But overall what I was consistently in awe of was the caliber of writing that this book held. The way in which Emily crafts her story so intricately around tales passed down through generations of Native American tribes across the country and weaves their threads into the plot and the characters is a rare talent – especially for a debut, no less. I don’t know where to begin this review, I’m just overflowing with good things to say about this book. I’ll try not to divulge too much info because the story is a tad hard to explain without giving too much away, but I honestly can’t stop saying good things about it. The world-building is as good a foundation as any to begin with, especially because it sets the stage for the entire story. Emily immediately establishes the small town of Union, Kentucky in a way any reader could liken to their local small town, as it incurs the same sense of nostalgia you get when yearning for a place you seldom visit or may have never been before. Because of this, I could so clearly visualize everything laid before me without Henry needing to go into explicit detail about setting. Every ounce of what makes this book so incredible is how well-crafted it is. Like I’ve said before, because I’ve been a creative writing student for the last four years I often read with a critic’s eye and look for the mechanical side to good writing. Emily certainly did not fail to deliver, because I can only hope to one day be this good. If this is just her first novel, what’s to come is sure to be spectacular. The plot was so massive and all-encompassing that you can’t help but get lost for hours when reading. You slip in and drift among the pages so easily, just as Natalie and Beau do between one another’s worlds. Fans of Donnie Darko will certainly attest to the parallel universe theory and butterfly effect theory coming into play, but not in a way that makes you skeptical or would make your brain hurt. This was logical and felt possible. And as little breadcrumbs are left throughout the story as to what is to come, a delicate and fragile timeline begins to work its way into the forefront of the story and completely and totally make sense while doing so. Beau and Natalie’s love made my heart soar and sing and break and laugh and cry, rinse and repeat. You never get bored with this story, you never feel as though it’s a romance novel, you never feel as though their issues are trivial. It’s all laid out in such a perfectly logical yet somewhat surreal way that you can’t help but see the story for so much more than a love story. The characters in this book all felt so real, as if you had met them once before in your life. Matt, Megan, Beau, Natalie, Grandmother, Alice, Jack, Coco, and Natalie’s parents were all so individual and unique that they no longer felt like characters but human beings. Sometimes while reading, characters will ghost in and out of your periphery if you don’t grow attached or if they aren’t formed to the point they feel human; this certainly was the opposite of the characterization in this novel. 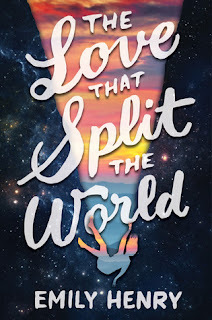 Even when the worlds split and came together again, universe parallels and worm holes galore, the parallel versions of each character felt so natural and likely to exist in each world. I sing so many praises of this book because if you ever read it, you’ll know what it is to feel loved, to feel in love, to miss a family member, to question your self-identity, and most of all what it is to grow up. Because my life at this time so similarly parallels Natalie’s in that I am nearing my final days of high school in my hometown I’ve grown up in, the story just resonated that much more with me. I liken my Mamaw to the character Grandmother because when I was younger it was always my Mamaw who would recite to me stories in the dim of night; stories that demanded to be felt, rather than simply heard like those in this book. I think it’s because of this that I liken Grandmother to being my favorite character, but Alice was a close second because she made me think of Christina Yang from one of my favorite TV shows, Grey’s Anatomy. I feel like I see a little piece of myself in each character, but Natalie most of all (especially because of her love for Stevie Nicks). We’ve all come to a point while growing up where the ultimate question of “who am I really?” hangs over our heads, and to see Natalie undertake her journey of self-discovery, forgiveness, and deep head-over-heels love was so reassuring. I believe there is a little bit of something for everybody in this book, because it truly cannot fit into any one mold or category. It’s got romance, it’s got action, it has the coming-of-age feeling of growth and nostalgia, and most of all it just feels so real I miss the characters already as though we were fast friends who spent the past week with one another. If you only read one book in the next few months, it had better be this one. I'm sooo glad you loved this book, it's pretty high on my tbr and I can't wait to get my copy!! Loved your review! 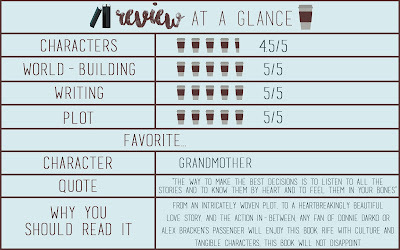 Can I just say, I really like how you rate books with coffee instead of stars. It's pretty darn cute. 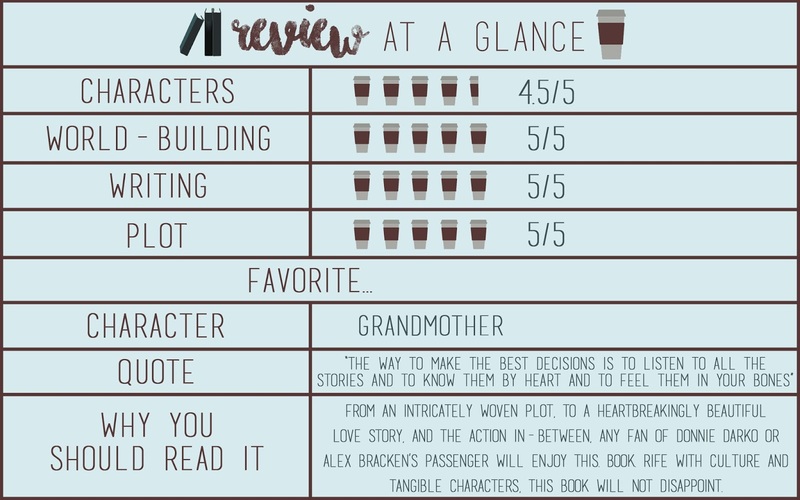 Oh and I also like the neat little summary of your opinion before the actual review. Anyway. I've been wanting to read this for quite some time now. It's received so much positive feedback already, even though relatively, it has only been recently published. I can see that you enjoyed the book as well. Fantastic review!